Grilled barbecue bamboo forest the kitchen made from vegetables and meat is an indispensable dish of the big occasion of K’ho Highlands. But very few people know K’ho forest rolls baked and raw materials this dish is not easily available. 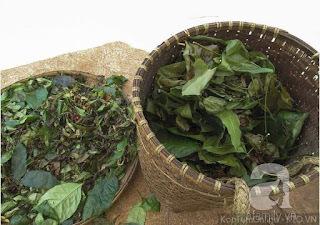 Leaves the kitchen is a vegetable indispensable in the lives of people K’ho Highlands. With K’ho, the food here is not only to bring vitality but also tether them with mountains. So, each year in the Highlands K’ho to eat at least one meal of vegetables the kitchen to keep your body stay healthy. 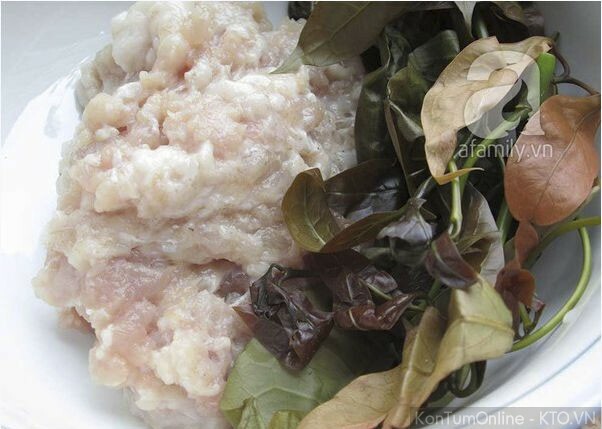 Even those residing abroad K’ho, each homeland never forget to bring a few dried leaves the kitchen to eat with porridge upon returning the West. Grilled barbecue bamboo forest the kitchen made from vegetables and meat is an indispensable dish of the big occasion of K’ho Highlands, but now is not easy to be enjoyed. Reason by vegetables the kitchen was exploited to exhaustion in nature because many people believe that this is a precious food, with similar medicinal properties of rhino horn. 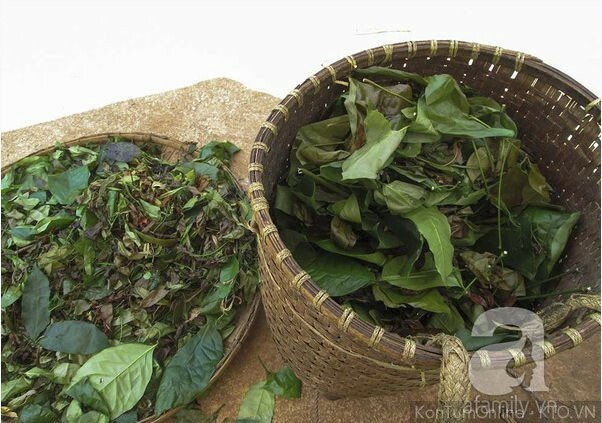 Furthermore, due to cultural oblivion, only a few people know K’ho processing these items properly mature and traditional taste. 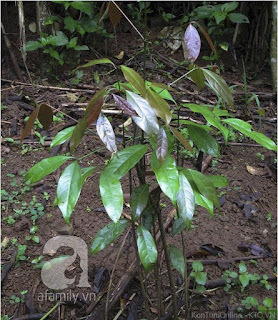 Convince forever, he K’Bem – one of the few who can do rolls baked bamboo forest under traditional taste of new K’ho bear to spend time taking me to the kitchen for vegetables. And of course, the journey to find material for forest baked rolls will not be easy. 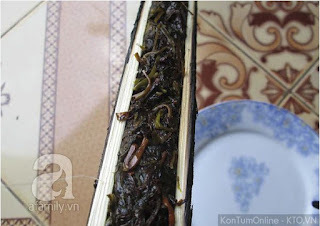 He K’Bem – who can make baked rolls bamboo forests properly traditional flavors. Road to the forest to find the kitchen vegetables. 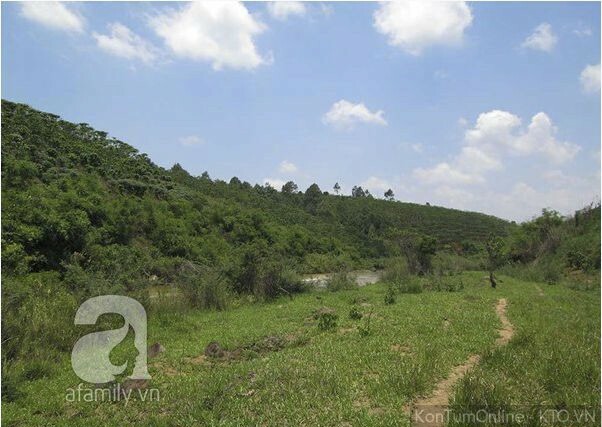 We come from the early morning, overcome bad than 40 kilometers to reach the mountains new Da Ambin, Bao Loc – where the kitchen vegetables. After some searching, we found the kitchen vegetables first. Thanks to his experience K’Bem, after a morning, we also obtained a decent achievement. Vegetable and the kitchen first. To process this forest rolls indispensable bamboo tube. Which is bamboo with burning sparse, thin crust and young, by old bamboo will flammable, rolls will not tasty. 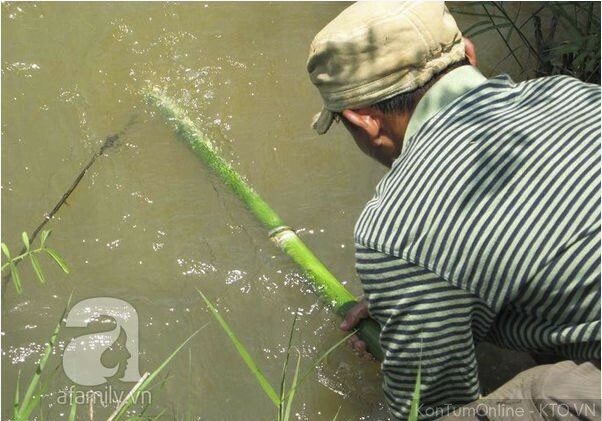 To retain the traditional flavor, bamboo tube necessarily be rinsed before Yam Da River water brought. Bamboo tube is removed from the riverbank Caucasian Yam, near cave dwelling of 2 tiger mother ‘s house. 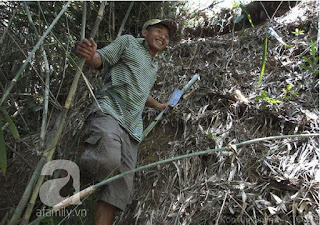 His bamboo pipes to be washed through the river K’Bem Da Yam before take. Forest rolls right will include two servings of vegetables the kitchen and one part wild boar meat, but not so easy to find wild boar, so he K’Bem temporarily replaced with a pig’s bacon. Minced pork with smooth beads. Vegetables are picked clean the kitchen, only bud. 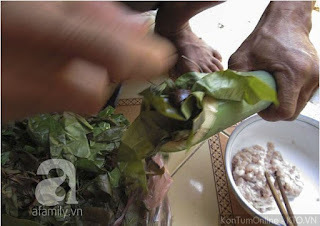 After preliminary processing of raw material finished, he leaves the kitchen K’Bem cleverly wrapped around minced pork and stuffed into bamboo tubes mixture. Raw materials of rolls, grilled chopped bacon salt and vegetable seed and hats of the kitchen. Knead the ingredients into a bamboo tube. 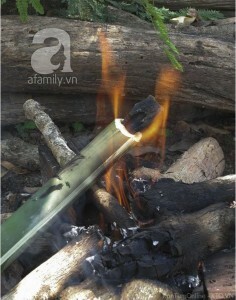 When the tube is full, he K’Bem first plugged in bamboo with a bamboo stick and grilled help transpiration by flames in the direction from top to bottom. He said if the grill opposite direction, the food will overflow or burst pipe. 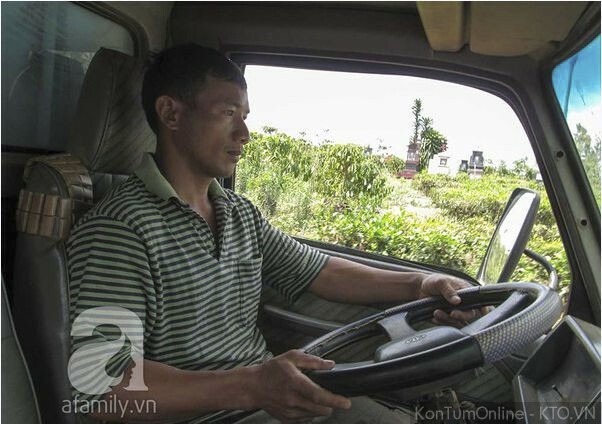 When baked rolls forest, he K’Bem continuous pipe to rotate rolls are cooked evenly. A moment later, the smell emanating fragrant spring rolls cooked signaling. Grilled grilled over open flames. After the meal, he K’Bem ingenious split bamboo pipe to get cha. For grilled over open flames, high temperatures should all fat in meat melted and absorbed into the vegetables. Greaves only a vegetable particles mixed in the kitchen. Now pick up a piece rolls into your mouth, you will feel the fat, fragrant, sweet, fleshy meat and in vegetables typical Highland earth. 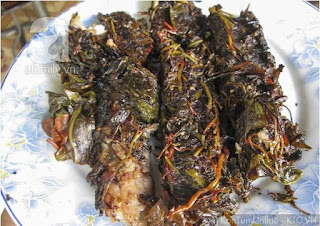 Forest rolls are usually laid out the disc, eating with flame grilled buffalo meat, vegetables and wine. Vegetables the kitchen is considered a natural herbs that you can process more soup dish, eat hot pot, grilled and customized dishes, vegetables will have different flavors. For example, the kitchen cooking vegetables with meat, even you will not need more seasoning, but if eaten with beef hot pot, it will produce sour. Play through it seems simple, but if not properly processed vegetables people eat the kitchen can cause diarrhea like poisoned if you eat undercooked pipe porridge so early.